Tsetse fly 'milk' gland. 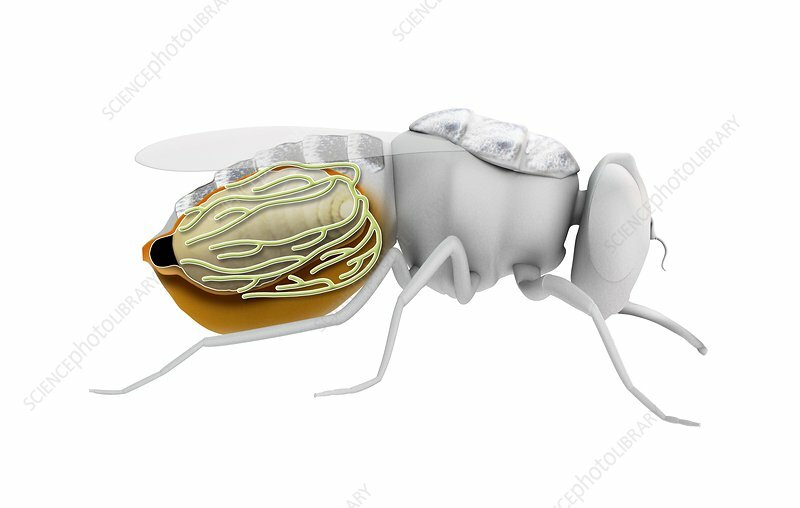 Computer illustration of a female tsetse fly (Glossina sp.) with a larva (beige, oval) in its abdomen, which it is feeding using a substance secreted from its 'milk' glands (beige lines). Tsetse have an unusual life-cycle. Females fertilise only one egg at a time, which they retain within their uterus, where the offspring develops internally during the first larval stages (adenotrophic viviparity). During this time, the female feeds the larva with a milky substance secreted by a modified gland in the uterus. In the third larval stage, the larva finally leaves the uterus.